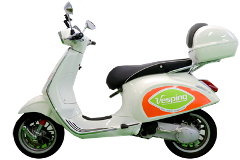 All inclusive price: Vespa + Travel Plan + 1 Tank Gasoline + GPS + 2 Helmets + Lock + Third Party Insurance + Taxes ONLY IN WINTER: Use WIN30 promo code to get 30% discount, for order of more than 60€. 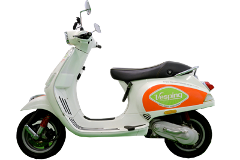 This Vespa has a sport style seat, so even if allows two people on it, is more confortable if used by one person only... Scooter driving experience & valid license required! 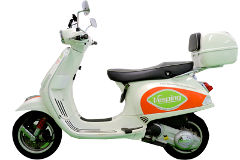 This Vespa has a larger and more comfortable seat for the passenger compared to the regular 50cc Vespa and also has an extra box on the back to store the second helmet. 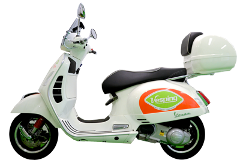 Scooter driving experience & valid license required! 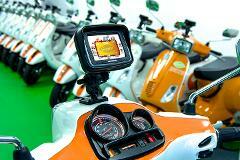 For adventurous people, who want to explore Barcelona and its surroundings with a powerful Vespa. The box has a lot of space and the helmets can be stored under the seat. Scooter driving experience & valid license required!